Sanitas – Latin for "health" and "sanity". Sanitas has been a successful brand in the wellness and health market since 2000. The range of Sanitas products is continuously increasing to meet the increasing demands of customers. The product range is attractive with modern technology, a wide range of functions and good design. 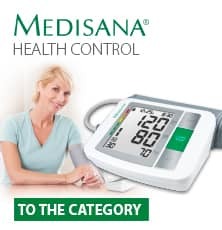 We offer products for blood pressure, body temperature, heat, heart rate monitors, massage, gentle therapy, tooth care and weight.